The Supreme Court has found a Jewish school guilty of race discrimination for refusing places to pupils it did not consider to be ethnically Jewish. Nine justices ruled, by a small majority, that the JFS in London had breached race relations legislation. The case was brought by a Jewish man whose son was not given a place because his wife was not regarded as Jewish under rules set by the Chief Rabbi. The parents were angry that their Jewish status was being questioned. Giving the court's verdict, Supreme Court President Lord Philips said: "The majority of the court has concluded that the JFS admission policy does discriminate on the grounds of ethnic origin and is, in consequence, unlawful." "A minority disagrees, considering that the admission requirement is exclusively a religious requirement and does not depend on ethnic origin." But he stressed that while the school had acted unlawfully over its admissions, it should not be regarded as racist. "The majority have made it plain in their judgments that the fact that the JFS admission policy has fallen foul of the Race Relations Act certainly does not mean those responsible for the admissions policy have behaved in a way that is racist, as that word as generally understood." The school went to the Supreme Court after three judges at the Court of Appeal ruled in June that the entry criteria had racially discriminated against the boy, known as M.
Chairman of governors at the school Russell Kett said the school and governors were disappointed at the ruling. "We must now set about establishing a more workable solution for a Jewish practice test to be used for admissions in 2011. 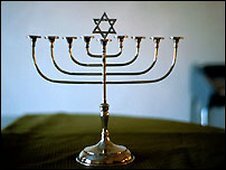 "JFS School felt it had no alternative than to continue to press for its test of 'Jewishness' to be based solely on orthodox Jewish religious law, rather than on a series of factors which themselves have no relevance under Jewish law, but which seem to support the notion of a test of Jewish practice required by the English legal system." Chief Rabbi Lord Sacks said the matter required "careful reflection and consultation" and instant reactions would be inappropriate. "The closeness of the court's judgement indicates how complex this case was, both in English law and in debated issues of Jewish identity. "Our office will be working closely together with the schools, the United Synagogue, the Board of Deputies and other interested parties to consider the implications of the verdict before making a full response." The 12-year-old boy was refused a place at the JFS (formerly known as the Jews' Free School) in Brent, north London, despite regularly attending a Progressive synagogue. While his father is Jewish by birth, his mother is Jewish by conversion. However, the conversion ceremony was conducted by a Progressive rather than an Orthodox synagogue, which is not recognised by the Office of the Chief Rabbi. The children of atheists, and practising Christians, were allowed to attend the school as long as their mothers were considered Jewish. Although Liberal Jews say faith is about belief rather than ethnic origin, Orthodox Jewish supporters of the school said the Supreme Court's ruling risked infringing their human rights by interfering with the way they have always been defined. The BBC's religious affairs correspondent Robert Pigott said the impact of the ruling on other faith schools was likely to be limited because of the close relationship between faith and ethnicity in Judaism. He said the JFS and other Jewish schools would now have to test for admissions on the basis of religious belief and practice and participation in the Jewish community. Schools Secretary Ed Balls said: "All faith schools must follow admission procedures that are non-discriminatory, and consistent with the admissions code and the law. "This is the case in the vast majority of faith schools and I understand that the JFS has amended its admissions policy in light of updated guidance from the Office of the Chief Rabbi."